It is time to register for our next Common-Thread Give-Away Drawing. This month's featured artist is Debbie Glessner. She participated in Maria Wulf and Jon Katz's Open House this summer with her amazing photography. She also makes jewelry and has chosen to give away a pair of earrings for our free give-away drawing this month. All you need to do to register to win them is to go to her blog site and leave a comment for her anytime from Monday through Wednesday and she will announce the winner at the end of the week. Her earrings are silver filligree dangle sorts with glass faceted beads. The bottom bead is smoky color with flashes of purple. In between the beads is a Swarovski ring. The smaller glass bead has a purple tinge and they are topped off with a pearl. They measure two inches in length. As I don't know Debbie well, I asked her to tell me some things about herself. I am always amazed at how multi-talented our artists are and Debbie was no exception. She is the co-founder and co-director of a therapy dog organization called Nor'wester Readers. They put therapy dogs into school classrooms to work with children who have emotional and learning challenges. She has two black Labrador Retrievers named Heidi and Hannah, and she visits three classes a week. She loves to see the magic triggered by the presence of her dogs. Debbie is an administrator and member of the CGBF (Closed Group Bedlam Farm). Her primary creative thrust is photography, but in addition to doing digital collages, she likes to do patchwork and photography note cards, earrings and zentangles. She has posted samples of her various crafts on line and all are beautifully done. She is also a writer and won the short story contest that was run by the creative group last year when it was called the Open Group. Last, but not least, I glean from her blog that she is a breast cancer survivor and has written about her personal journey in her blog, AND SO IT IS, my journey with breast cancer and beyond. Her blog tells that she is cancer free so her journey is now going beyond her illness, into her many wildly varied creative ventures. Don't miss getting to know Debbie better and do check out her many different earrings featured on her blog. We want to extend a warm welcome to Debbie as our featured artist of the month and I hope everyone will enjoy visiting her blog and getting to know her too! Thank you Debbie for your generous give-away gift! The Common-Thread Artist Group is currently comprised of Jon Katz, Maria Wulf, KimGifford, Rachel Barlow and myself.To learn more about these artists, please visit them at their websites located on the side of my blog. The purpose of our group has been to support each other by sharing our collective talents and blog sites with each other's readers. 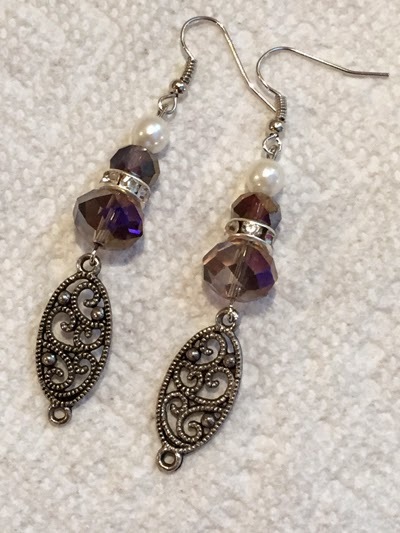 Again, to sign up to win this free pair of earrings, just go to Debbie's blog site and leave a message for her anytime from Monday through Wednesday and she will then draw the lucky winner and announce the winner by the end of the week.Good Luck! Labels: Debbie Glessner, Free Give-Away Drawing, jewelry, photographer, writer, zentangle artist. Common-Thread Artist Group.